I know, we’re all busy with spring cleaning, nobody has the time to sit around and listen to Jeff ramble on interminably about esoteric minutiae. So we’ll keep it short and focused. And lovely. 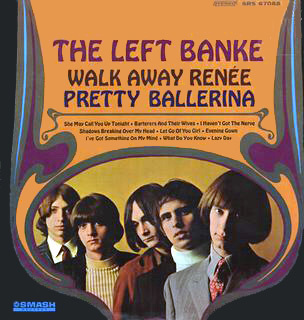 The Left Banke was a two-hit wonder – ‘Walk Away, Renee‘ and ‘Pretty Ballerina‘. But their two hits are indeed wonders, the most successful attempt to instill classical ingredients into art rock. In jazz, there was an entire movement in the 1950s, The Third Stream, producing quite a body of music that has held up over the years. In jazz this fusion was more serious, injecting a contemporary classical sensibility – Brubeck, the MJQ, George Russell. In rock for the most part, ‘baroque rock’, ‘Bach rock’, or (my favorite) ‘baroque & roll’ was rather pitiful and pompous, these two gems excepted. These two songs employ baroque-ish mock-fugal lines, a quasi-harpsichord keyboard, a restrained little string section, and a light, breathy vocal. Kind of like a ‘kosher-style’ deli. Judging by their history, The Left Banke (gee, nothing pretentious about the name, is there?) was a bunch of spoiled kids from New York. Their leader and songwriter, Michael Brown, was 16 when the group formed in 1965. They made a few recordings which the record companies enthusiastically ignored. After the band had recorded the basic track for ‘Walk Away, Renee’, composer Brown split for the coast. The band finished up the track without him, Smash Records picked it up, and in July, 1966, it hit #5 on the Billboard Hot 100 (‘Satisfaction’ was #1), followed by ‘Pretty Ballerina’ (#15) half a year later. They recorded one quite respectable album on which the two hits appeared. I knew it well ‘back in the day’ and recently revisited it. It’s quite pleasant, but I don’t recommend walking out of your daughter’s wedding to go look for it. If you happen upon it, it won’t hurt you. And I even performed the service of listening to the second album, a death-bed flop squeezed out of a dying band by artificial inspiration. Don’t bother. ‘Walk Away, Renee’ was a bigger hit, you can hum it, you can dance to it, and it’s had more cover versions (most notably The Four Tops, which I will not understand as long as I live). So the winner, hands down, is ‘Pretty Ballerina‘, that precious, delicate flower from December, 1966. Thanks, guys. As you may know, the pretty ballerina was Renee herself. She was the girlfriend of one of the band members, but she found it a bit disturbing when a different band member got it into his head to write songs about her. But wait! Although “Pretty Ballerina” and “Walk Away Renee” are perhaps the Left Banke’s best known tracks, I must respectfully disagree with you Mr. Jeff that we are “left with two wonder hits. “She May Call You Up Tonight” is actually my favorite Left Banke track. Jingle jangle and a chorus that won’t go away after your ears stop hearing it. And there are a few pretty cool cover versions, Richard Thompson does a soulful take, and Sid & Suzie (Matthew Sweet & Suzanna Hoffs) add Suzanne’s sweet voice to sweeten it up. Also “Barterers and Their Wives” is another worthy contender. “Desiree” is a nice effort that tries to capitalize on Renee. In fact I rather enjoy their collection “There’s Gonna Be A Storm” every once in awhile. Some cheap cheese, I’ll admit. But we all know that makes the best mac & cheese. And I like my Left Banke with a double dose of Curt Boettcher (Mr. Pop Baroque) (A possible SoTW contender….????) and Zombies. Thanks, Jeff!!! I know that first album quite well, and I agree with you that it’s uniformly very nice. Richard Thompson covers which song? I’ve heard “Barterers” be accused of being antisemitic, but I’m not too convinced of that. I’ve never heard of Curt Boettcher. I shall definitely check him out. Enjoyed the post, as always. I once watched a program where Leonard Bernstein discussed contemporary music and noted the efforts of this group to use classical music in the song “Pretty Ballerina”. It appears your opinion had good company. Richard Thompson does a cover of Left Banke’s “She May Call You Up Tonight”. I’m pretty sure it’s on youtube. I’ll see if I can find a link. And of course I have seen your post on “Care Of Cell 44”. I like it! Curt Boettcher produced great pop symphonies. Not necessarily “baroque” but he was responsible for “Along Comes Mary”, “Cherish” and I think (but I may be wrong..) “Windy” by the Association. He is also responsible for many of (don’t laugh…) Tommy Roe’s hits like “Sweet Pea”, “Hooray for Hazel” and “It’s Now Winter’s Day”. Silly pop songs but check out the arrangements. But if you really want to catch the genius of Curt Boettcher listen to the albums The Millennium, The Ballroom and Saggitarius “Present Tense” which includes the classic track “My World Fell Down” (which deserves SoTW status IMHO…..) Lovely arrangements that would make Brian Wilson jealous. Thanks for letting me shoot off!! Ha! Thanks, Jeff. Walk Away Renee on the other hand, I like. Interesting sotw though. Thanks Jeff. Thanks for the leads, Kevin. Listened to Thompson’s ‘She May Call You’, quite liked it. Reminded me of The Byrds’ ‘Feel a Whole Lot Better’, which I love. Listened to a couple of Boettchers. Can’t say I was overwhelmed. Sure, that’s a style I very much hook into, but the music didn’t get to me. I’ll take your word that it’s worth pursuing. I would never laugh at Tommy Roe. Anyone who so blatantly imitates Buddy Holly in 1960 (‘Sheila’/’Peggy Sue’) deserves credit for knowing which side of the Stradcaster is buttered. People were not yet realizing the magnitude of the loss. Buddy covers increased as the years went on. I remember The Buckinghams’ album was ok. There were one or two others cut from that same cloth (at least in my mind), darned respectable albums by 1/2/3-hit wonders. Always appreciate the feedback. Always glad to hear suggestions for SoTWs. I almost always try to pick songs where I’m really secure about the background and context, or stuff that I’m just in the glow of discovering. So okay Jeff, the music nerd that I am has a playlist called Pop Symphonies and one of the songs that inspired that list was “Everything That Touches You” by the Association. Now that is a majestic song! I love how it builds to that crescendo. Two others on that list are “I Saw Her Again (Last Night)” (which in fact might be my most favorite single release ever) and “Twelve Thirty (Young Girls Are Coming To the Canyon)” by the Mama & The Papas. And I know that second album well. My dad bought that for me when I graduated Elementary School. The Cyrkle and especially The Buckinghams “Portraits” album were also favorites. Emitt Rhodes and his Merry-Go-Round” and even Spanky and Our Gang. Also on my Pop Symphonies playlist would be “God Only Knows” by the Beach Boys, “Tell It to The Rain” by the Four Seasons and even though it doesn’t quite have that big sound…”Darling Be Home Soon” by the Lovin’ Spoonful. “Five O’Clock World” by the Vogues. (Make me stop!!!) And heck, we’ve all done some things we regret, so Tommy Roe gets a pass because of his Buddy Holly connections. But keep listening to Curt Boettcher’s Millennium stuff. His albums have a great sound, lots of unusual instruments and arrangements, big choruses and hooks galore. Should have been all over the radio but left to obscurity and the preverbal cut-out bin. Love your site, thanks for allowing me to go off…and yes, it’s yours. I understand how SoTWs are chosen by you (not me) so keep doing what you’re doing. It’s fun. I’m writing this because the song Trip,Stubble and Fall is mentioned in the above comments.While still in Junior High School,ABC did a “piece” on the Mama’s and the Papas recording of that song;Trip,Stubble and Fall.Now don’t get me wrong;I do like the song.But…….what I saw on TV that night didn’t resemble what winded up on their LP.The TV version was simply amazing.Now I can’t tell you the difference,I only saw the show once,but the harmonies were different and they repeated them over and over again.I was so disappointed when the album came out.Of course,now I’m used to it;it’s all I’ve g to go on.I’ve tried finding it on YouTube,but no luck.I tell anyone reading this;if you find it,you’re in for MAGIC!!! @Doug–am looking for it. That sounds very interesting, thanks. @Kevin–I never thought of Pop Symphonies as a genre, but it does sort of make sense. I agree about ‘I Saw Her Again’. I’m a giant Sebastian fan, as you can see from my several postings. His ‘She is Still a Mystery’ would certainly fit in that genre, but what I love so much about the song is the music, more than Yester’s arrangement. Still, it’s divine. Re SoTW requests—don’t get me wrong, I’m happy to hear suggestions. I’ll be happy to try to write about anything that I feel I can do justice to. One more thing while I’ve got your attention;why are the comments turned off in the Buffalo Springfield piece?